Most chicken sausages are 140 calories or so per serving making it a great low cal dinner or lunch alternative. 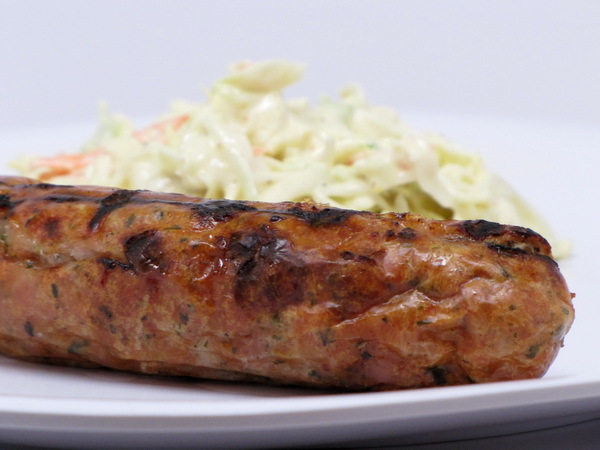 They certainly don’t replace pork sausage, but take them for what they are and you won’t be disappointed in their spicy, sausage goodness 🙂 Try serving with Zesty Coleslaw and a small baked potato for a great meal. Heat the grill or a frying pan and cook sausage until done throughout. The Morningstar Farms sausage links are made out of all veggies – the consistency is not quite there, but the sausage flavor is AWESOME. When placed on a nice big roll and smothered in peppers and onions, you don’t even realize that you are not eating real sausage ! This is a great way to still have one of your favorites but have a guilt free version. Place oil in large skillet and heat to medium high. Put onions in pan and saute 5 minutes. Move onions to the side, remove pan from heat and spray skillet with Pam. Return to heat and add peppers to skillet. Let cook down a little and then season with all the spices. After about 5 minutes, lower heat to medium and continue cooking to desired doneness. I like mine pretty soft and let them cook a good 20 minutes. If you do the same, you will likely need to add a couple tablespoons of hot water a couple times during the cooking process so that the veggie stay moist and do not burn. 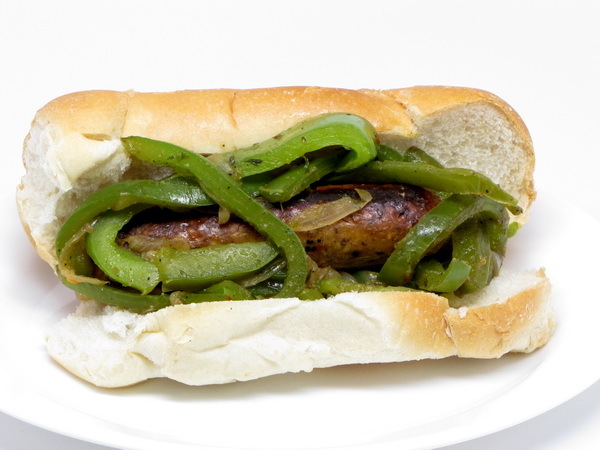 Place sausage on roll and top with peppers and onions.